A massive data release from Wisconsin’s Department of Public Instruction (DPI) Tuesday showed mixed results for K-12 students across the state. On the Forward Exam, math, science, and social studies scores all rose slightly, yet remain dismal. Only 43.8 percent of students are currently proficient at math. English scores are worse, and trending in the wrong direction. Last year, proficiency was at 44.4 percent. This year, it is 42.4 percent. 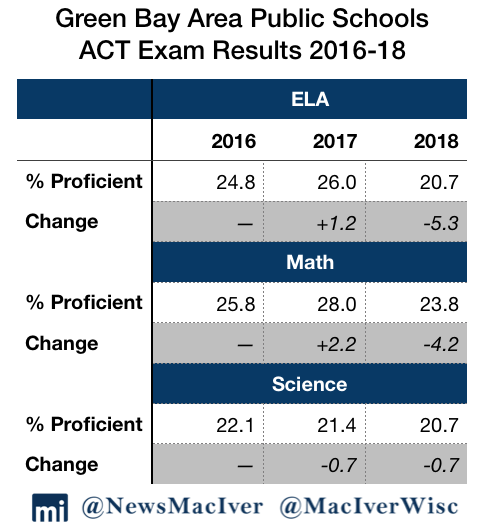 On the statewide ACT, results were more troubling. The percentage of proficient students fell in every subject. On English language arts, 37.1 percent of students were proficient, a 2.4 point drop from the prior year. In math, just 34.5 percent of students were proficient, a 1.2 point decrease. The overall average composite score was a 19.8 out of 36, down from the prior year’s score of 20.0. Read our first story, with a basic overview of the results, here. The situation gets more complex the closer you look. Districts including Milwaukee Public Schools (MPS) and Madison Metropolitan School District (MMSD) saw achievement gaps between black and white students widen. At both of those districts as well as at Green Bay Area Public School District (GBAPS), student proficiency was below the state average in every subject. At MPS, the state’s largest district, students made some improvements on the Forward Exam in math, science, and social studies. Math continues to be MPS students’ worst subject, with just 16.2 percent of test takers showing proficiency. However, proficiency has slowly improved since the first administration of the exam in 2016. The biggest improvement—and now the best subject area for MPS students—is social studies, where 22.3 percent of the student body is proficient. Social studies is also the best subject area for students in Wisconsin as a whole, with 50.6 percent of students demonstrating proficiency. MPS students fared worse in English language arts compared to the prior year, with just 19 percent of students showing proficiency in the subject, down from 20.1 percent in 2017. As a whole, MPS’ student body has made slow gains since the first administration of the Forward Exam in 2016. 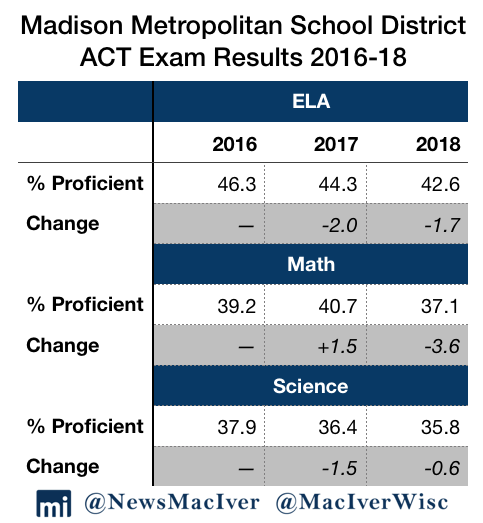 Since changing Wisconsin’s main standardized exam three times in three years, the public can finally see trend lines over three years to make better sense of how our students are faring. While MPS students made slow improvements in most subjects, achievement gaps persisted. The performance gap between black and white students increased in both English language arts and math, showing that many students are still lagging far behind their peers. This year, just 10.5 percent of black students at MPS are proficient in English language arts, and 9.1 percent are proficient in math. That’s a full 35.3 points below their white counterparts in English language arts, and 29.5 points below them in math. The achievement gaps have increased since 2016. MPS students fared worse on the ACT compared to the Forward Exam. With an average composite score of 16.1 out of 36 on the college entrance exam, the average score fell by 0.1 from last year’s average score of 16.2. 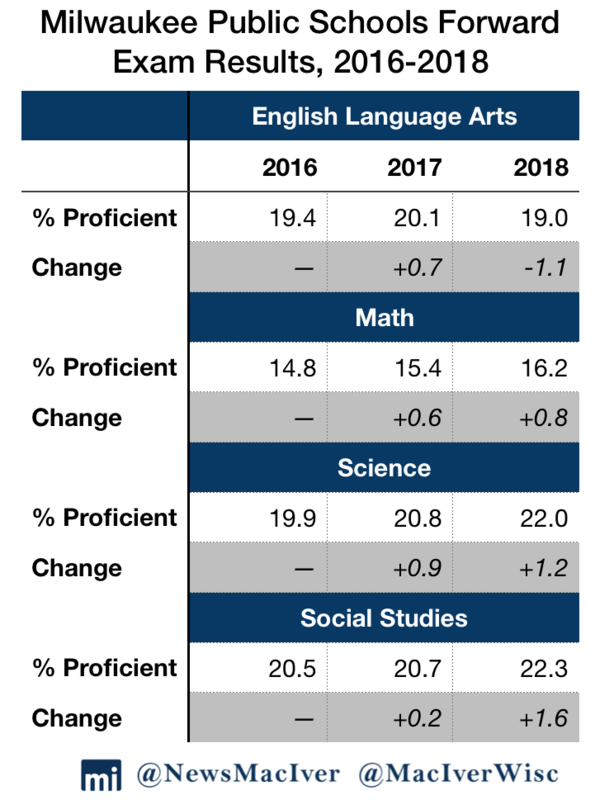 In all the subject areas for which proficiency on the ACT is reported — English language arts, math, and science — proficiency fell compared to 2017. 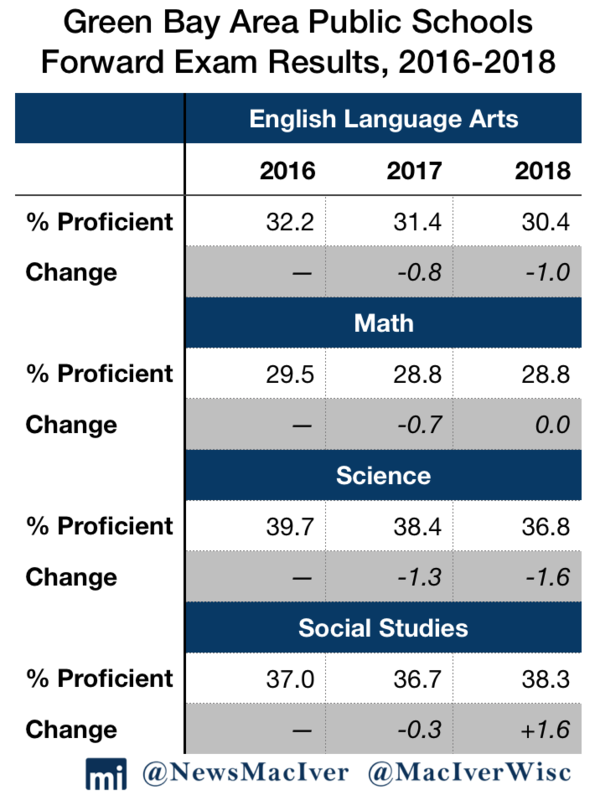 Student performance has declined the most on the ACT’s English language arts section, with 14.5 percent of test takers demonstrating proficiency in 2018. 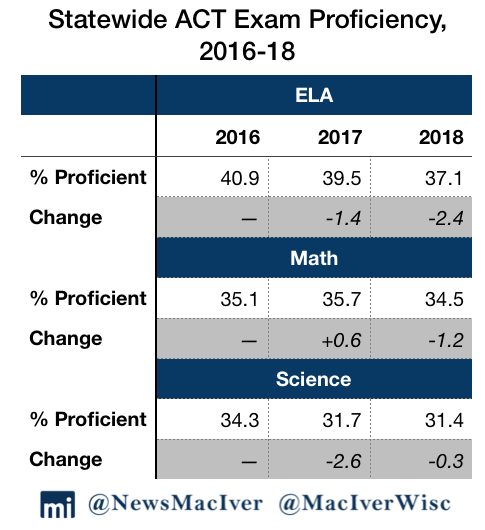 That’s down by 2.6 points since 2016’s achievement of 17.1 percent proficiency. In math, the percent of proficient students fell to 8.7 percent, and in science, to 7.4 percent. At the same time, more students opted out of taking the ACT Exam. More than 19 percent of MPS students did not take the test administered by the state this past spring. The share of students opting out of the exam has steadily increased. The state started paying for student’s ACT Exams in 2016, dramatically raising the participation rate across Wisconsin from prior years. That year, 15.7 percent of MPS students did not take the English language arts section. The next year, the opt-out rate grew to 18.0 percent, and this year, it was 19.6 percent. Given that fewer students are taking the exam, it is surprising that scores, too, have continued to fall. Not all students in Milwaukee struggled in the same way. Participants in Milwaukee’s parental choice program (MPCP) posted higher results than their MPS peers. 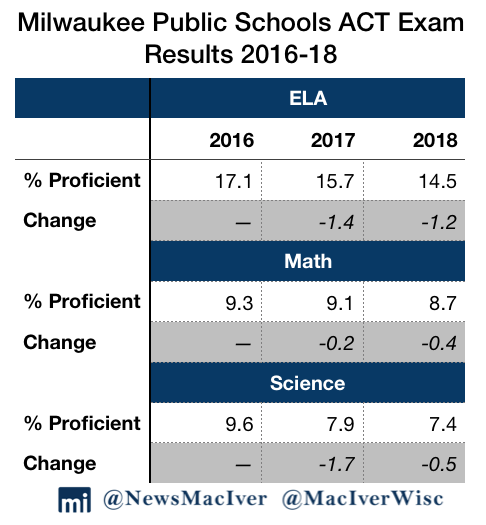 Among Milwaukee’s school choice participants, the average ACT composite score was 17.2 out of 36. That figure is higher than MPS students as a whole as well as economically disadvantaged MPS students, who scored a 15.5. Milwaukee’s school choice students achieved higher scores on every ACT subject compared to MPS students as a whole. At the same time, however, they still fared worse than the state average in every subject. Students in the state’s capital also struggled on both exams, with fewer students attaining proficiency than the state average in every subject. However, students also posted gains in every subject on the Forward Exam, continuing a promising trend. In all, 36.6 percent of MMSD students were proficient in English language arts on the Forward Exam in 2018, up a full percentage point from the prior year. With 38.2 percent of students proficient in math, students made the biggest gain in that subject area, improving by 2.3 percentage points over 2017. Similar to other districts as well as the state average, students fared the best in social studies, with 46.7 percent demonstrating proficiency. On the ACT, Madison students scored an average of 19.8 out of 36 points, just above the state’s average of 19.7 points. Just 5.3 percent of students did not take the exam. Student achievement fell on the ACT in every subject. 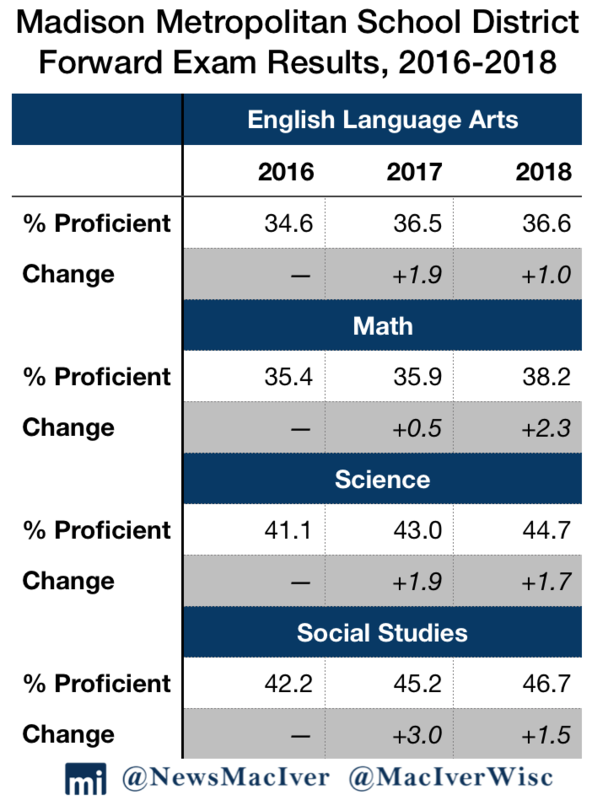 The greatest change since 2016 occurred in English language arts, where 42.6 percent of students demonstrated proficiency. In 2016, 46.3 percent were considered proficient. While MMSD students posted improvements on the Forward Exam, clear disparities between racial and ethnic groups exist. As in MPS, the achievement gap between white and black students grew over the prior year. However, the gap is even bigger at MMSD. While 59.8 percent of white MMSD students showed proficiency on the math section of the Forward Exam, just 9.8 percent of black students did the same. That amounts to a 50 point gap between white and black student achievement in the state’s capital. The gaps grew in English language arts, too. While 59 percent of white students were proficient in that subject, just 9.8 percent of black students were proficient, a 49.2 point gap. As the state’s minority population grows, these differences in achievement are likely to become even more stark, to the detriment of all. Further north, students in Green Bay Area Public School District (GBAPS) also struggled on both exams, scoring worse than the state average in every subject. The same percentage of students showed proficiency in math as last year—28.8 percent. The percent of students proficient in English language arts fell by one percentage point to 30.4 percent. In science, the percent of students proficient fell by 1.6 points to 36.8 percent. The only subject area where GBAP students showed improvement was in social studies, where 38.3 percent demonstrated proficiency. GBAP students fared considerably worse on the ACT Exam compared to the prior year. Just 20.7 percent of students were proficient on the English language arts section of the test, down a full 5.3 points from last year. In math, students dropped by 4.2 points to 23.8 percent proficiency. The results are particularly surprising because students have now taken the ACT Aspire for several years in a row. That exam, taken by freshmen and sophomores in high school, is meant to prepare students for the full ACT that they use on college applications. While Green Bay students improved their ACT Aspire scores in English and math, they fared worse in reading and science. This year, 41.6 percent of GBAP students showed proficiency on the ACT Aspire. Just over one-quarter, 25.7 percent, were proficient in math. The data release comes just over a month before the release of Wisconsin’s district and school report cards. That release is largely built off of the Forward Exam figures, but also provides a wealth of other information for every school in the state, assigning them values on a 100-point, five-star scale. On the 2016-17 report cards, MPS received the second lowest district score in the state, with 56 of 100 possible points, two stars, and a “meets few expectations” rating. GBAPS received the same two-star rating and 62.2 out of 100 points. MMSD received 66.5 points, putting it in the category of a three-star, “meets expectations” rating. Curious about a district we didn’t cover here? Let us know in the comments, or check out the data for yourself at DPI’s data warehouse.